The OBHL Rookie Program at Grimsby Peach King Centre, Fifty Point Conservation area and Confederation Beach Park is for Boys and Girls of ages 3-5 and all skill levels! Get Outside, Play Ball Hockey and Have FUN! The Rookie program is 1 hour sessions on Saturday’s (between 10 am and 2 pm) where we run fun drills, and games to get players engaged and having fun. Half of every session is used to run a fun scrimmage game. Register Online Anytime by clicking on the “Youth” registration button on the home page or Come into the OBHL-Fifty Point Office at Fifty Point Conservation Area. Fifty Road and QEW (tell the gatehouse you are there to register). Call or text the office at 905-520-7965 to make sure we are open. 10 Sessions, Learn to Play and Have FUN! Space is limited for this program register early before it's full. Our Learn to Play and Have FUN! 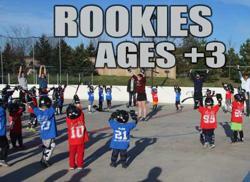 Program is designed to introduce little ones to the grass roots level of the sport of hockey. The hour sessions are split up into FUN activities and games for this age group. Parents are encouraged to bring their stick and join us on the floor to get active and involved in the fun! Tim Horton's is the Sponsor for Youth OBHL Ball Hockey.....Thanks Tim Horton's for supporting the community ....mmmmm Tim Horton's Always Fresh! Coaches are an important part of fun youth ball hockey. Our staff invites parents to bring their stick and join in on the fun on the rink to help encourage the little ones and play safe and fun ball hockey! Promoting a positive environment and teaching hockey skills, sportsmanship, respect, and having fun are most important! ©2019 OBHL - Outdoor Ball Hockey League / SportsEngine. All Rights Reserved.